2019’s The Luminous Dead is Caitlin Starling’s debut novel. Gyre Price lies to get the contract for a solo caving expedition. It’s a calculated risk: caving is dangerous. But the payoff for the foray could be lucrative enough to pay Gyre’s way off the dead-end colony world of Cassandra-V.
Cassandra-V’s wealth, such as it is, is based on subterranean mineral deposits. It’s a reasonable guess that Gyre’s employer hopes to discover a new vein of ore. A guess is all it is, as the employer is oddly reticent about the project’s goals. This isn’t the only piece of important information that Gyre has not been given. The employer knows that Gyre lied about her experience but hired her anyway. Cassandra-V has extensive cave networks, many extended by a local life form known as Tunnelers. Expeditions can last weeks. Cavers use powered, sealed suits to extend their range, as well as consenting to modest surgical modifications that enhance their chance of survival. As is done in mountaineering, many expeditions pre-place supply caches, in order to extend time underground. On the surface, Gyre’s expedition seems to be well-organized and supported. Her suit is top quality. The project has been ongoing for a fair time and has stocked an impressive number of caches. But there are also hints that the endeavor is odd. Lone caving is more dangerous than heading down in teams. Why spend so much money on the suit if Gyre is then sent out alone? Gyre does at least have a communications link with a mission control, but even that is weirdly deficient. There should be a rotating team supervising Gyre. Instead there is a single person, a woman named Em. Em is not a solitary overworked employee. She is the boss. Why all the oddities? We find out that Em is rich and she is not motivated by the desire to add to her considerable wealth. Instead, she is obsessed with finding the answer to a family mystery: what really happened to her parents years ago. She has funded expedition after expedition down into the endless dark. Gyre is the thirty-sixth caver to work on Em’s project. Only eight survived. Each failed expedition, each death gives Em more data. Surely she’s getting closer to her goal. True, the death rate means lying to her employees and fiddling with their suit’s data feeds when necessary. True, the cavers eventually catch on to all the lies. No worries. Not only are Em’s volunteers recruited from the desperate poor, the contracts they sign surrender bodily autonomy. Besides, it isn’t like anyone aside from Em will know if Gyre joins the legions of the dead down in the Stygian maze. While the cavers might be poor and desperate, easily replaced, their suits are high tech and expensive. This raises the question of why the mining companies don’t just go with remotely piloted vehicles? Communications aren’t necessarily a road-block; Em manages to maintain contact with Gyre throughout most of the book. Obviously, from the author’s perspective it is because readers want a human with whom to identify … but what’s the in-universe reason? Readers may go into this expecting the usual SFnal twists: the unseen horrors waiting to leap out of the shadows, the Dread Secret That Renders All Existence Meaningless, that sort of thing. While it is true the Tunnelers are a hazard, most of the dangers Gyre faces have always been inherent in caving: cave-ins, falls, drowning, equipment failures, and of course, encroaching madness as the darkness, isolation, and lack of sleep erode Gyre’s mind. One does not need ghosts and many-angled beings for horror. Sometimes, unlit confined spaces are sufficient. Starling’s novel is claustrophobic in setting and cast. Gyre wanders in a dark, confusing labyrinth with only the occasional corpses of her predecessors and Em’s voice for company. Em and Gyre are the only two characters with active roles; in many ways this novel is an extended conversation between two people whose backstories are parallel and whose mutual dependence is expressed in repeated attempts to manipulate the other . Em and Gyre are strangely alike — except that Em has the wealth she needs to indulge her obsession and that she can do so without any risk of personal harm or death. 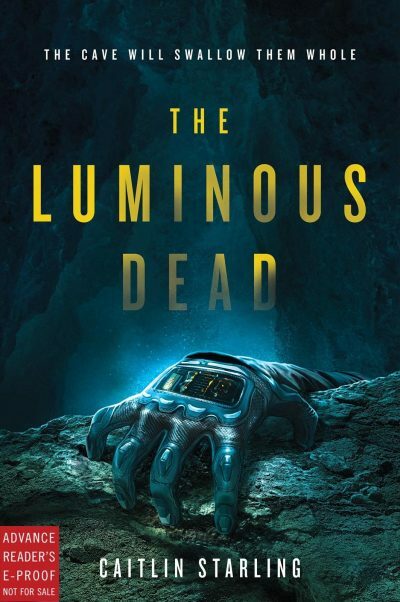 The Luminous Dead is available here (Amazon) and here (Chapters-Indigo). 1: The Luminous Dead would make an interesting play (stage or audio).